For as long as I can remember, I longed to go on a cruise. It seemed like such a luxurious vacation where everything was taken care of for you with so many choices for fun, relaxation and making memories. My husband Paul and I decided to take a Royal Caribbean cruise for our honeymoon in 2002. We traveled on one of Royal Caribbean’s newest ships at the time – Adventure of the Seas. It was one of the most remarkable vacations we had ever taken. We loved it so much…..we were teary-eyed waiting to go home in the airport when it was over. 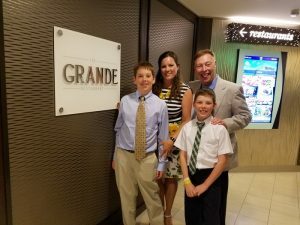 That day, I vowed that someday we would take our family on a cruise…..
Well, that vow became reality in October of 2016 when Paul, our two boys, my parents and I boarded one of Royal Caribbean’s newest ships, Anthem of the Seas. We had booked the cruise a year and a half in advance in honor of my upcoming 40th birthday. It’s all I wanted for my 40th ~ Just to be with those I love the most in the place I love the most – a cruise. After waiting over 500 days, reading hundreds of reviews and researching every minute detail, we were ready to make the very most of our dream cruise vacation. I have little words that do justice to what being on Anthem with my family for 9 nights meant to me. We soaked up every single second and experience and made THE. BEST. MEMORIES I could ask for. No cooking, no dishes, no grocery shopping, no laundry, no planning, no school, no work for 10 days. Just pure fun, laughter, eating, relaxing and making memories. We are already planning our next cruise and looking forward to it with such anticipation. I feel so fortunate to be a part of Mouse Made Simple, with an emphasis on cruises and cruising. Being Type A and a very detail-oriented person, I offer my clients both my personal experience of cruising and love of delving into the specifics of ships, itineraries, tips and hints to provide to best, organized and well thought out cruise vacation. I look forward to sharing my love of cruising with you and working alongside you to make the most of your upcoming cruise.